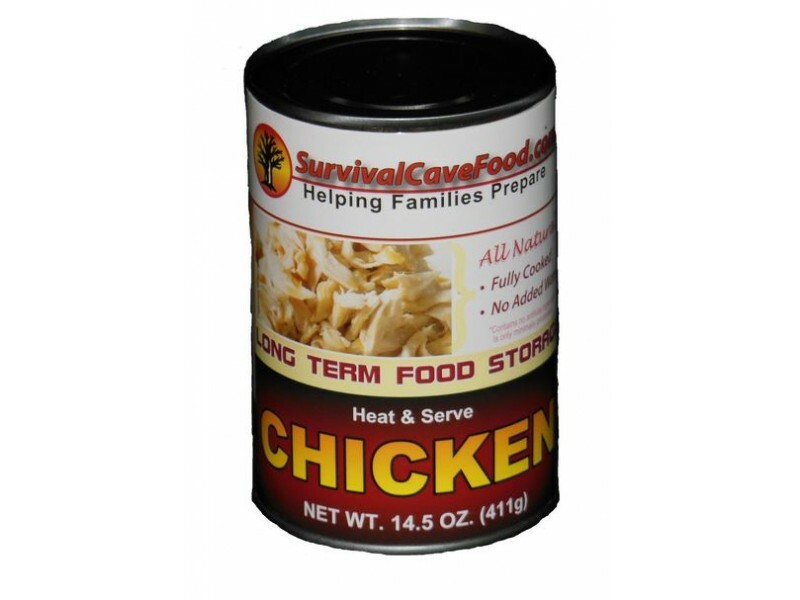 Buy Survival Cave Pre-Cooked Canned Chicken. The best pre-cooked Chicken. 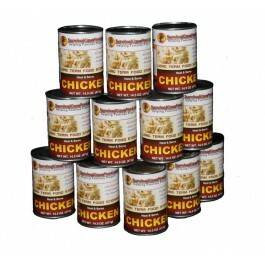 Survival cave canned chicken is an excellent addition to any emergency food storage plan. Each can contain 14.5 ounces of specially cooked chicken so it not only lasts for years on the shelf, but it also tastes great when you open it. When you order this full case of chicken, it will come in convenient cans, so you only have to open up what you’re going to be eating. This means less wasted food, and more full stomachs for you and your family. Having enough food and drink in the event of an emergency or a disaster is absolutely essential. 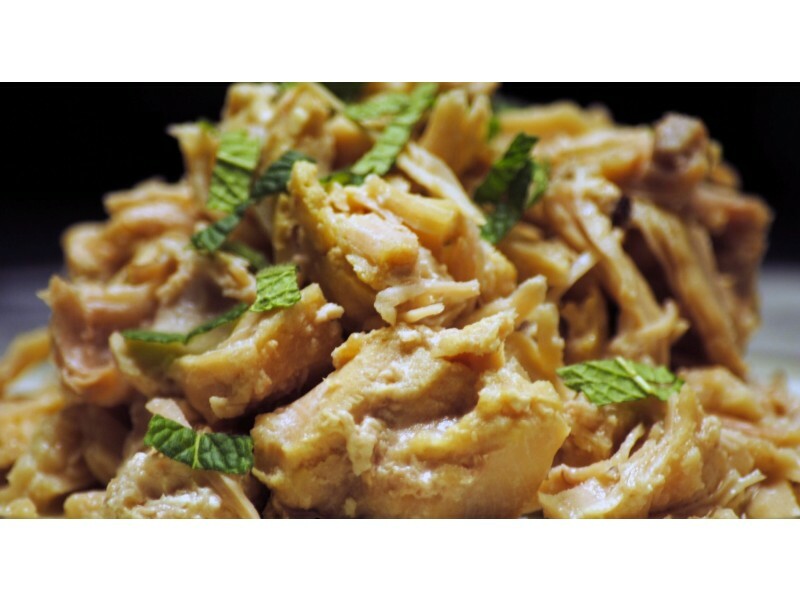 Pre-Cooked canned chicken makes a great addition to your emergency food stores. Survival Cave Food – Chicken, has a great taste and a long shelf life as well. You can put it in your emergency shelter to see you through a hurricane or tornado, or you can take it with you when you go camping. Each box comes with 12 ea. 14.5 oz. cans of pre-cooked chicken which allow you to only open the number of cans you need to feed the family. There are 5 helpings of chicken in each can, making that a whooping 60 helpings for the entire box of chicken. You can eat the chicken as is, or you can use it as an ingredient in other chicken recipes. The fact that no broth or water has been added means that you get nothing but succulent chicken pieces that will make your mouth water. Each bite releases a burst of flavors for your enjoyment. Our pre-cooked canned chicken is completely natural. No chemicals, additives, fillers or MSG added. 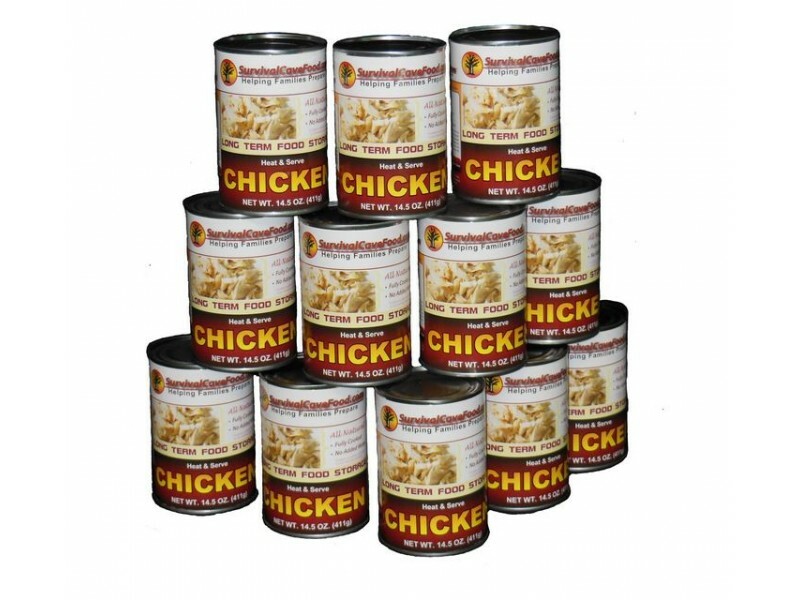 Whether you are ordering this canned chicken to use in your family recipes, to use when camping with friends or family, or to add to your disaster food stores, you will be getting the best tasting chicken ever. You will get a total of 12 cans with 14.5 ounces in every single can, no water or broth added, simply the all-natural juices of the meat. Which is virtually 11 pounds of fresh mouthwatering healthy hand packed and cooked meat. 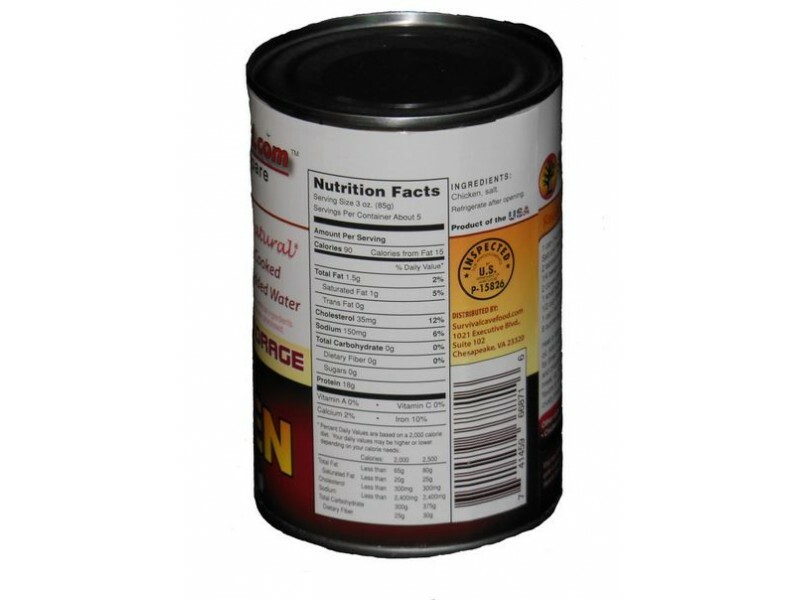 Our canned storage meats are all natural and never incorporate any MSG, additives, fillers or chemicals. They are low in sodium, low in fat and balanced for your family members. USDA inspected Survival Cave Food canned meats are just manufactured using 100% USDA inspected meats. Various other canned meats are foreign meats or state they are prepared in the USA however the meat in reality comes from other countries and are only packaged in the united states. We just use 100% United states of america meats! This flavorful line of meats is prepared to provide you with the maximum quantity for your food dollars. There're simply hand packed and “non mechanically separated meats” so we also NEVER ADD WATER or broth. This makes certain that everything you purchase is meat. After you open these cans they are simply ready to eat and delightful in just about any recipes you'd utilize fresh cooked meat.